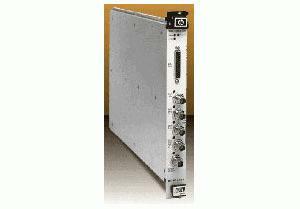 The Agilent E1445A Arbitrary Function Generator is a C-size, 1-slot, message-based VXI module. It provides the flexibility to produce virtually any waveform needed. The deep memory allows downloading a large number of waveforms at once, and can store up to 128 waveforms using SCPI programming. The memory sequencer lets you link waveform segments together in any order. These sequences can be repeated 1 to 64 k times or continuously. Within a sequence, the segments can be repeated up to 4,096 times using only one sequence memory entry. This memory structure lets you build large, complex waveforms out of small segments.